Abstract - Since last two decades, agile software development methodologies have been one of the most debating topics for researchers. These are called light weight development methods because of informal, adaptive and flexible approach. These models are based on the collection of best practices which help to handle problems related to changing requirements, customer satisfaction, and product quality. A number of agile models are available to meet the needs of different projects. However Extreme Programming and Scrum are two most familiar and commonly used models. This study makes a valuable contribution by exploring these models in detail. In this paper a detailed comparison of Extreme programming and Scrum is conducted to find their similarities, differences and explores those features which complement each other. Abstract - The rapid growth of online examination using internet based tools in lieu with increasing reliance on technology and other shared resources has revolutionized the way authentication is being initiated and carried out in this information age. The unprecedented growth in electronic examination (e-exams) has underlined the need for more secure, faster and more suitable method of user’s verification than passwords can provide. Despite, the numerous advantages of biometric systems and its impact on various sectors across the globe, most users still face the issue of defining the right and accurate biometrics technology system in solving particular problems. This paper addresses the issue of accuracy by proposing an image enhancement approach that incorporates SecuGen fingerprint in conjunction with electronic learning environments to curb unethical conducts associated with electronic examination in a university environment. Minutiae points which are one of the unique features of fingerprints were extracted using the Crossing Number (CN) Concept by extracting the ridge endings and ridge bifurcations using the local neighborhoods of a ridge pixel from a 3 x 3 window. At authentication stage, the fingerprint is captured again with the extracted features compared with the templates stored in the database to determine a match before a student can login to write an examination. Abstract - A cellular network is a wireless communication network, in which different network entities play their role to establish a secure connection for transmission of data over a network. 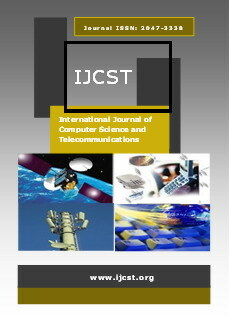 This paper provides an insight about different features required for an efficient transmission over a communication link for e.g. Wi-Fi, WiMAX, 3G and 4G. We have briefly explained the different cellular technologies used by cellular networks nowadays and their comparison based upon the data rates, speeds and currently used technologies. Finally, we have summarized the comparison of various cell phone service providers in Pakistan with the hope that the future of the struggling telecommunication industry in Pakistan will be bright for future generations to come. Abstract - This paper presents a Psychiatric Outreach Expert system. It is used to know if the applicant needs the services of the “center for psychiatrically impaired elderly”. It also evaluates the regular patients to determine if they are still appropriate for the services rendered by the center. The language of implementation is the SWI-Prolog. Facts and rules were formulated from the knowledge acquired from the human expert. This paper therefore, discusses the task the Psychiatric Expert System (PES) performs, the problem-solving paradigm involved, the knowledge contained in the system, and the lessons learned from designing and building the system. In addition, it highlights some future works to be done to make the project more standard. Abstract - Performance Improvements and decreasing execution time had been started half a century ago, along with the development of new chipsets and microprocessors with increased clock speeds, the software engineers have also developed ways to increase the performance of their developed systems by introducing new language constructs and other performance improvements. As we know there are many software modules that are complex like airline monitoring systems, multi-variable differential equations, AutoCAD 3D drawing, and HD graphics video games that require immense computations that a single processor could not perform. The solution to this problem is to utilize the ubiquitous commodity of modern world – The Multi-Core Processors. A major hurdle in utilizing this commodity is the overhead needed at the developer end to convert a single threaded application into a multi-threaded application. This paper intends to find a comprehensive model that could be used to overcome this hurdle by introducing new pragmas in existing code, or tweaking in the compiler so that automatic parallelization is introduced at the compiler level. Abstract - With the emergence of anomaly intrusion detection system, varieties of unknown intrusions that was not detected by the misuse or signature based intrusion detection system can now be identified. Anomaly intrusion detection system works by building profiles of normal system state or user behavior, applications and network traffic and continuously monitor the network's activity so that deviations from the established profiles of normal system state are interpreted as attacks or intrusions. Anomaly intrusion system is efficient but has its weaknesses due to problems arising during classification of known and unknown intrusions such as difficulty of building models of robust behaviours, high false alerts rate caused by incorrect classification of events in current existing system. This paper presents an improved, modified KNN classifier using clustering optimization which is more effective at curbing both known and known intrusions in existing anomaly intrusion detection system. In this paper, we input the attributes of the NSL-KDD training dataset to be classified by the improved KNN (Known Nearest Neighbor) classifier with clustering optimizer inclusive after its been verified by k-mean clustering algorithm and optimized by genetic algorithm respectively. We then evaluate the performance of the improved KNN classifier and compare with the existing KNN classifier and the result showed the existing classifier had a correctly classified test data instance of 98.7% efficiency and 0.2395% for the incorrectly classified instances while the newly developed classifier had a 99.6% efficiency for the correctly classified instances and 0.3222% for the incorrectly classified instances. Abstract - Wireless Sensor Networks are crucial substructure made up of microcontroller, sensing units and communication interfaces that is designed to enable the users possess the capability to measure, collect and responds to phenomenon within the surrounding been monitored. WSN are viewed as an edge between the physical and the virtual world. More so, the demand of fluid transportation from the production point to the region of end users has led to an increase in the number of pipelines that are fabricated globally. The paper presents architecture deployed to the pipeline structure to measure the flow rate, pressure and temperature at the inlet and outlet of the pipeline and then send the sensed data to the control centre via their communication links for immediate response. The simulation procedure carried out using MATLAB Simulink environment shows the capability of the system to detect leakage along the pipeline as evident in the flow and pressure measurement trend of the graphical output results.